There's a battle in the sky between a Momma Bird and her eggs and she's not happy about it! FlipFlap is a mobile, pong style game that keeps you on your toes. Developed by Rise & Shine Games, an indie game design and development studio in Louisville, KY, the game is featured in the Kentucky Fried Pixels Bundle, the first game bundle consisting of games made entirely in the Midwest. 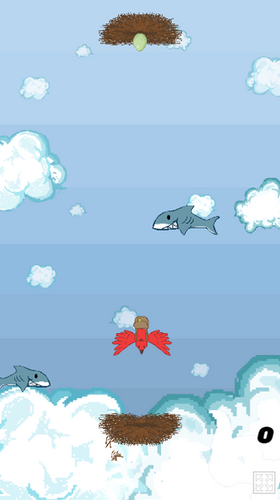 The player is a bird flying back and forth from nest to nest trying to catch her eggs. Watch out! Not only can birds fly, but sharks have moved their feeding ground from the sea to the air and the eggs are just bait for the real meat. 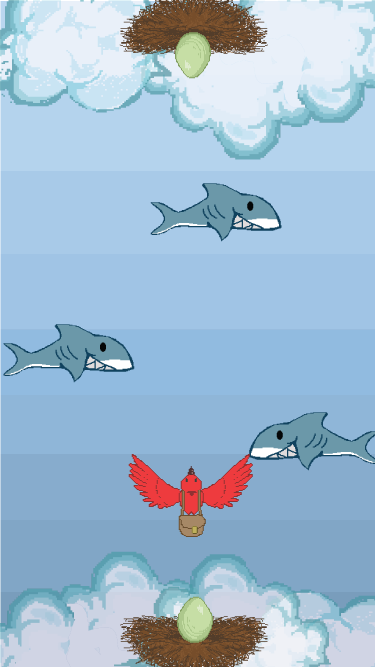 Tap the screen with your finger to switch direction and escape the sharks. Collect eggs to unlock more levels and if you press the right buttons, there might be an extraterrestrial adventure in store. Is this a reskin of a UNITY asset?